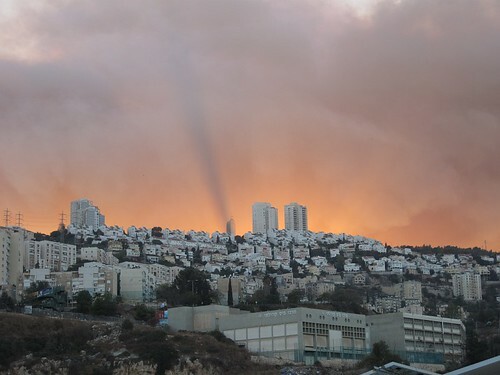 Israel faces a desastrous forest fire on the Carmel hills around the port city of Haifa, Israels third largest city. Over 40 people have been killed in the firestorm. Thousands of dunams of forestal land have already been devastated. Whole villages have been destroyed. 17.000 people had to be evacuated. Israel asked the international community for help. Help from Greece and Turkey already is at the location. Therefore, people in Haifa and elsewhere in the country are upset about this. For centuries, the reforestation of the land of Israel ist part of the nations pride. And rightly so. Until today, generations have contributed to the Jewish National fund to make this enormous work possible. How it comes that no preparations whatsoever have been made to protect this valuable nature against proliferating fires, i.e. a most common threat in dry regions? Maybe not all of Israels „security considerations“ should focus on warfare items. Currently Israel extends its defense infrastructure by introducing the „Iron Dome“ rocket defense shield. Nobody wants to talk about the costs of this system, for saving lifes is invaluable. America wants to contribute some outstanding 250 million Dollars. Each battery of this system costs about 10 million Euros, and at least 20 batteries are needed. Why not take a tiny share of these inconceivable costs and buy at least some fire-fighting planes and pay the fire-brigades a decent salary? Even better: Why not transform the whole of this ridiculous Iron Dome system into something really useful?